The ultimate walking wagon for yóur child care! The ultimate wagon for child care! Children love being outdoors, and they will love a ride in a Rambler outdoor wagon. 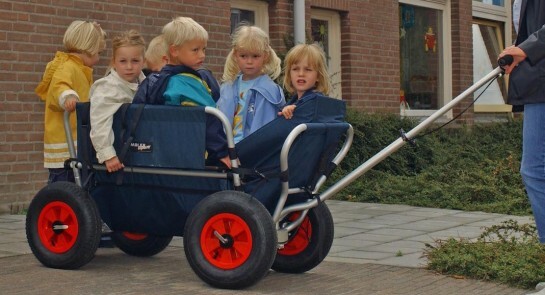 Whether for riding across the schoolyard or in the park, the woods, or the dunes and the beach, the Rambler wagon provides an ideal way of transporting multiple children up to 7 years old. All wagon models are child friendly and due to the solid assembly and quality of used materials the wagons are guaranteed to last. The size and choice of materials for the various models are suited to the purpose of transporting several children of different ages in a safe way. The walking wagons are easily foldable and thus save space. The unique design of the Rambler wagons makes them lightweight which reduces the physical strain for pulling the wagon to a minimum. 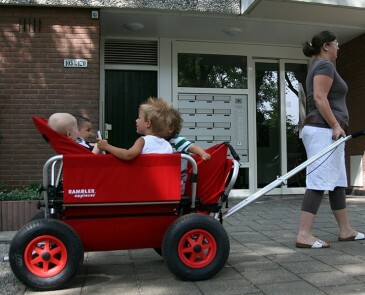 With the optional push bars for a 2nd person the child care wagon is even easier to move. The child care wagon rolls smoothly over any type of terrain. 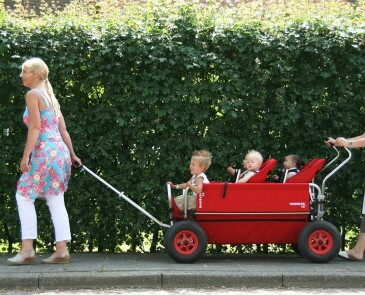 The ideal walking wagon for child care! Why is a Rambler the ideal outdoor wagon? Suitable for all ages from 0 to 7 years. Easy exchange of baby-seats and other accessories. Compact wagon in dimension: fits through every door. More models up to 10 seats. Large wheels are useful for curbs, sand, grass and gravel. Hood available for rain, wind and sun. Children can step in themselves through the backside. No lifting or climbing. With the push bars you can move the wagon with 2 persons! Top-quality, will last a lifetime. Wagon sides printable for advertising! Pulling a cart is easier on soft surfaces, for example in gravel, grass and sand. One pulls the wagon a bit out of the soft surface. When pushing you also push the front wheels into the soft surface, which makes the wheels get stuck. When pulling the wheels always follow the walking direction and the wheels are controlled by the pull bar. This saves much additional steering on uneven surfaces and takes no effort. Extra to the pulling, in addition a second person can push the wagon with the pushbars. The Rambler outdoor wagons are the only ones in its kind to move forward with two persons.